A few days ago, the picture of a Sikh police officer protecting a Muslim man from a mob went viral in the social media. The officer in the viral image, Gagandeep Singh was showered with praise. However, BBC News resorted to peddling fake news when reporting the incident. 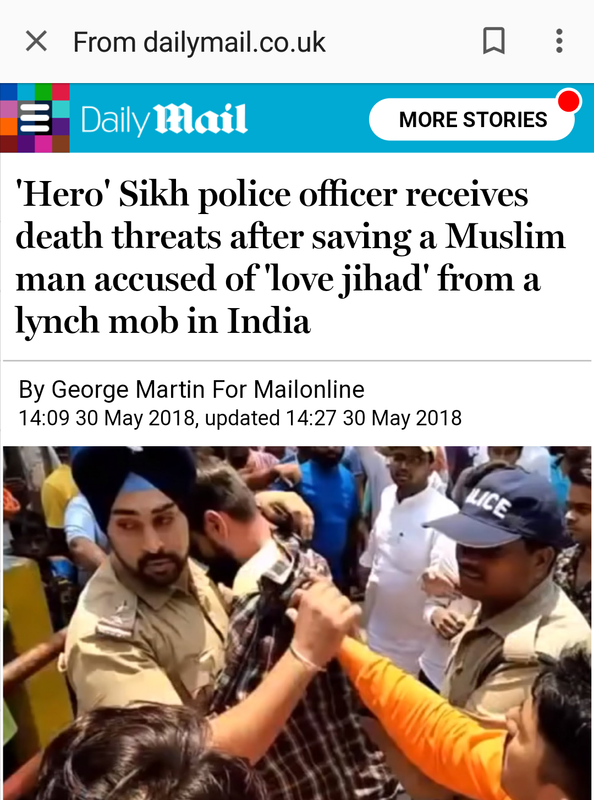 In an article titled ‘India Police officer threatened for saving Muslim man from mob‘ BBC News claimed that Singh was criticised for his actions and has been receiving threats on his life. The article claims that the officer has been sent on leave because of the threats on his life. However, they do not quote him or name any source for the claim. They just arbitrarily state that police officials working with him have claimed so. Not only BBC, other foreign news sites peddled the same fake news as well. As often happens with most such fake news articles, it was soon picked up by self-proclaimed liberals and journalists. The article claimed that Hindu groups were threatening the officer. Indian police officer gets death threats for saving Muslim man from mob – BJP backs mob, MLA says this was attempt by the Sikh officer to hurt feelings of Hindu community. To confirm the report, we called the police officials at Ramnagar Police station, where Gagandeep Singh is a sub-inspector and asked about any threats being received for saving the Muslim man. The officials at the station denied any such threat and also denied making any such statement to media outlets. “Yeh galat Khabar failayi ja rahi hai, na hamein koi dhamki mili hai, aur na humne kisi media ko dhamki milne ki baat kahi hai” was their response. Certain News corporations never miss the opportunity to malign India and the majority Hindus population. Their incessant peddling of the ‘minorities are under attack’ narrative often centres around fake news, distortions and selective outrage. This was just another attempt by BBC. Social Media users are now slamming the BBC for reporting the fake news. Fake News By @BBC @BBCHindi @BBCIndia:Sikh Cop Who Saved Muslim Man From Mob Is Receiving Death Threats. International publications have been regularly indulging in peddling fake news and fake narratives about India. New York Times does it regularly and UK publications are no exception either. Instead of trying to invent false news in India in their attempt to create a religious divide and malign Hindus, perhaps UK based publications should focus more on the problems in their own backyard where Muslim grooming gangs have been abusing generations of little girls right under the nose of authorities. Despite their fake news being called out, BBC and Dailymail are yet to retract their fake news articles.